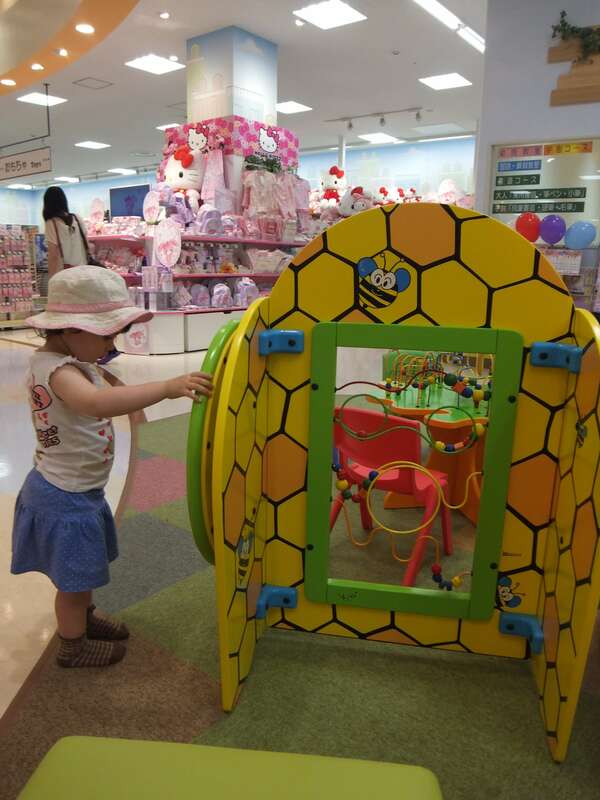 I was suitably impressed with Saitama’s latest mall in Ageo and have found a new hang out for my toddlers and baby. 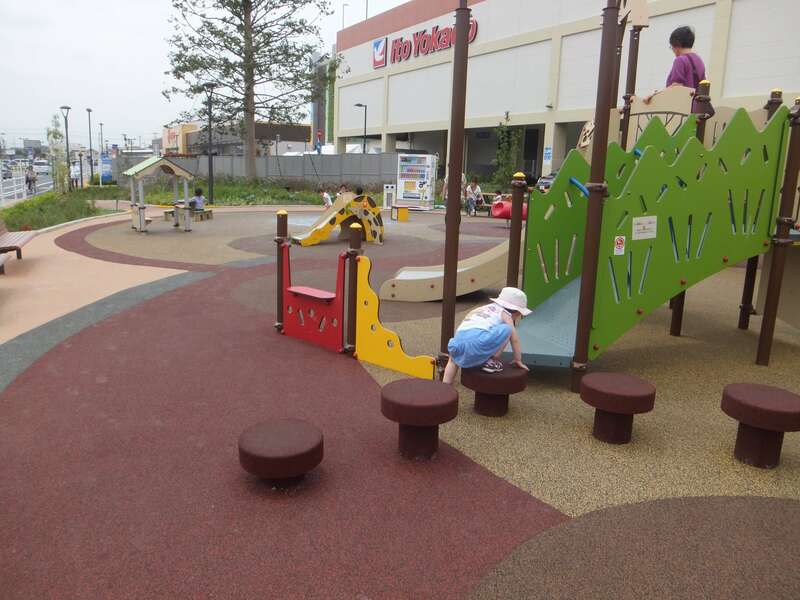 Ario in Ageo has a real modern feel to it and I think it’s the most toddler friendly mall in this area. Peony Walk in Higashi Matsuyama has long been our haven for hot or rainy days, but I will be switching it to Ario in Ageo due to the free facilities and services for young children. 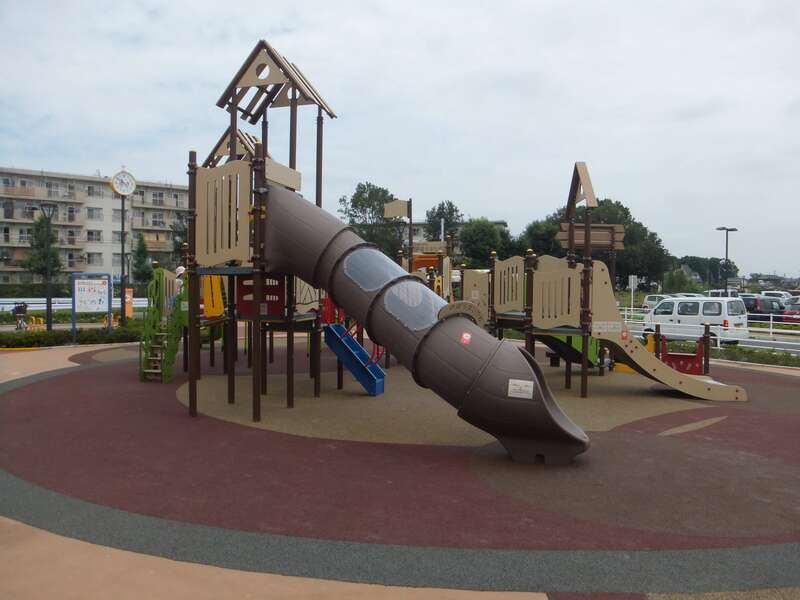 Today, I parked in the “Giraffe” parking area, because I had read on their Japanese website that there is a playground beside it. Upon arriving I noticed there are actually two. One playground has nothing to do with the centre itself, but is just off the back of the carpark. 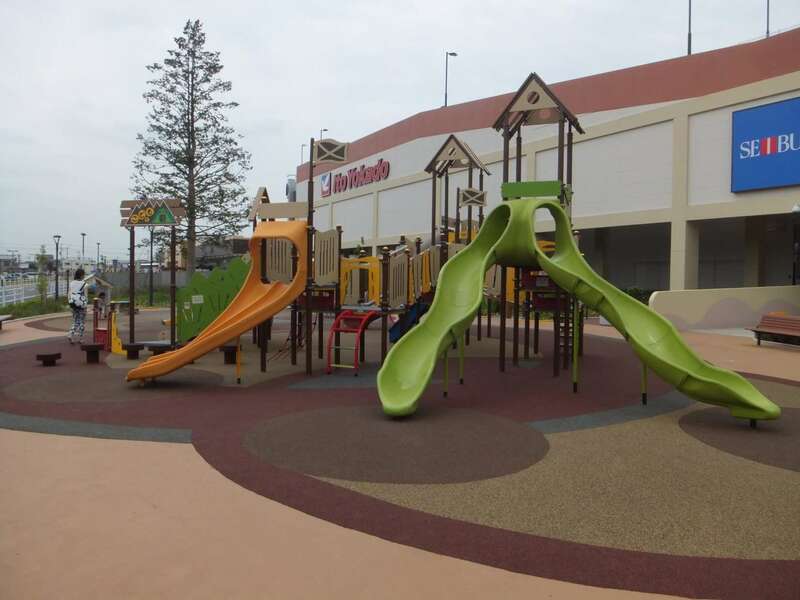 The other playground opposite the entrance/exit to the Giraffe parking zone is part of the mall. 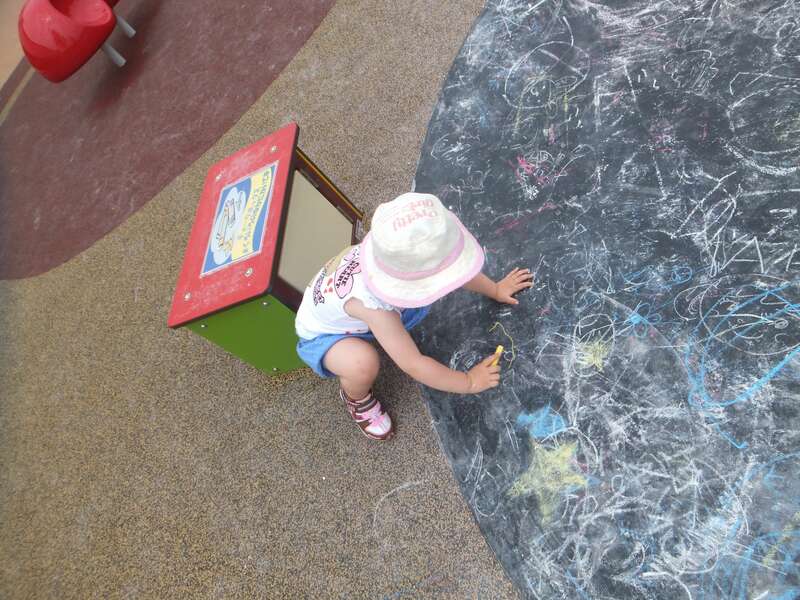 It has the unique feature of a designated area to draw with chalk, provided for free for the children’s use. 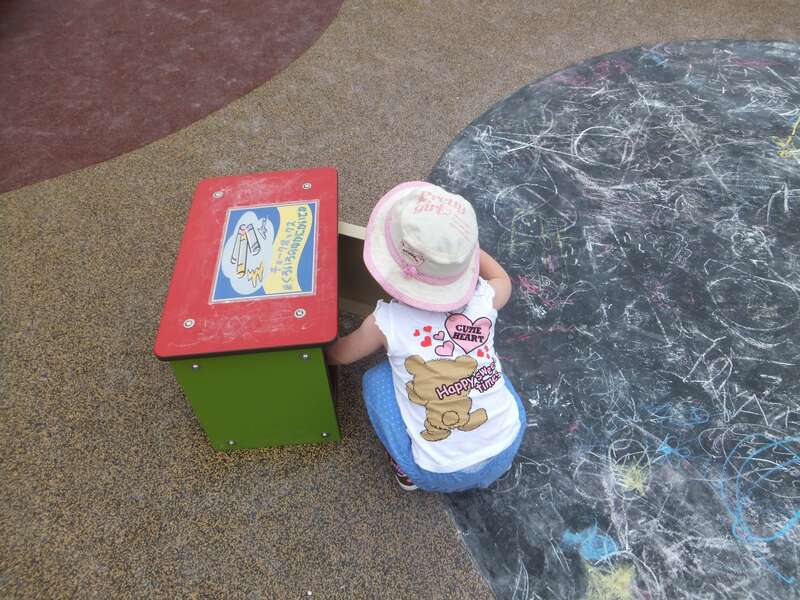 It isn’t a huge playground, but there is more than enough to entertain young children for a half hour or so. Slides are always a favourite with my kids and this playground has six as well as climbing activities, stepping stones and a little hut. 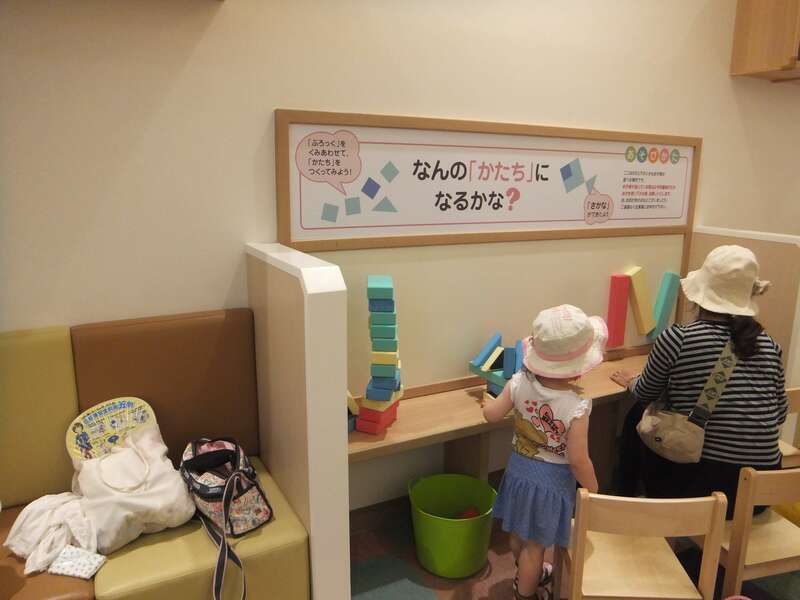 The fun continued indoors in the “Kids Labo” on the first floor, beside the entrance near the playground. 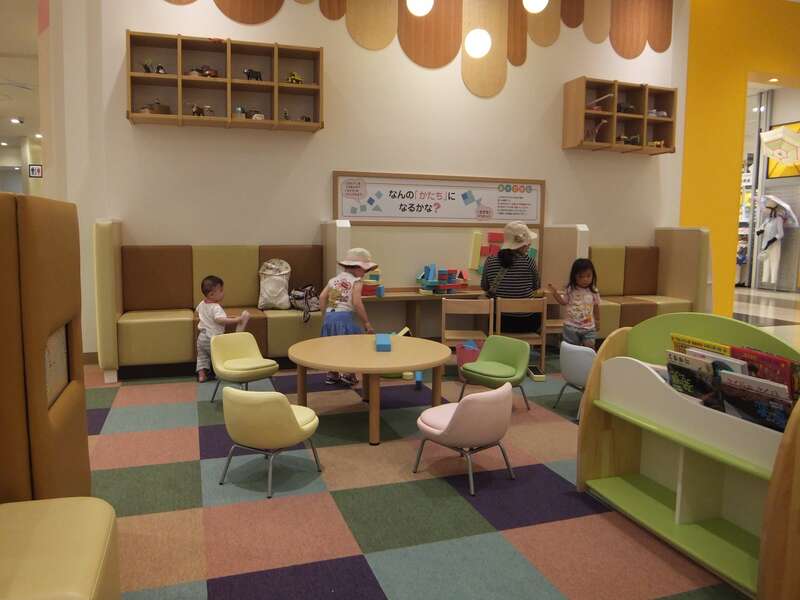 It is a rest space with a magnet wall and large padded magnets to make shapes. It also has a decent selection of books for toddlers and children of kindergarten age. 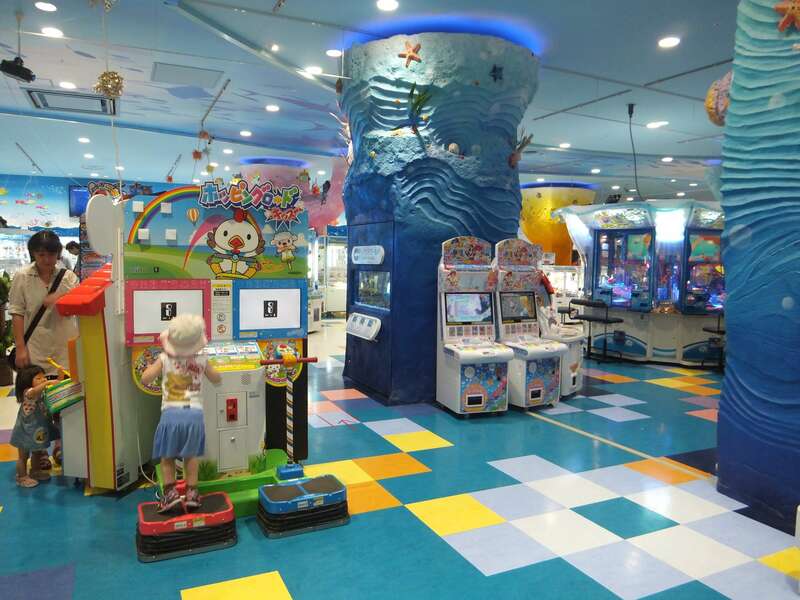 Upstairs there is a large amusement area (games, slot machines, anpanman machines, purikura etc), which could be costly except that my 2 year old is still happy to play with the machines without money in them. What I like about this amusement area is that they have a free space they use for different events. 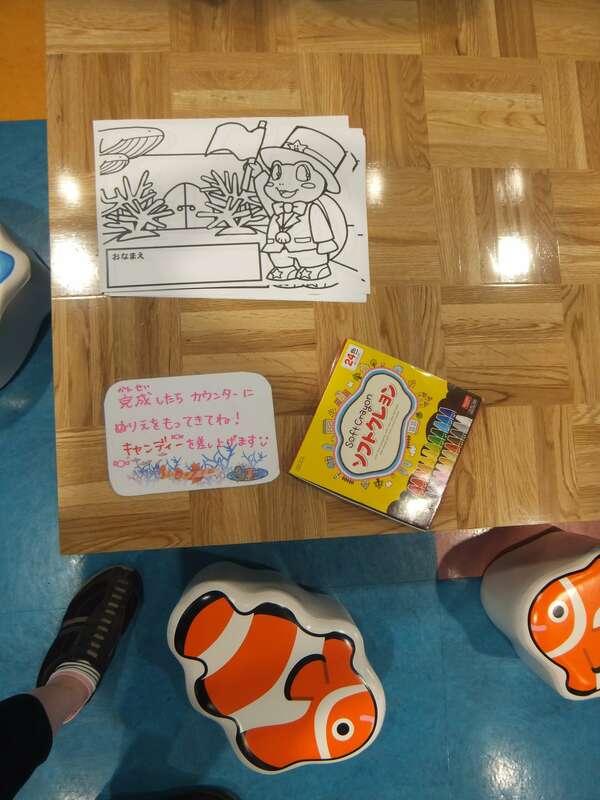 This week they have tables out with cute little fish seats, with colouring books and crayons for younger kids to use for free. Last week they had a large pool with play fish and kids could do a fishing activity. 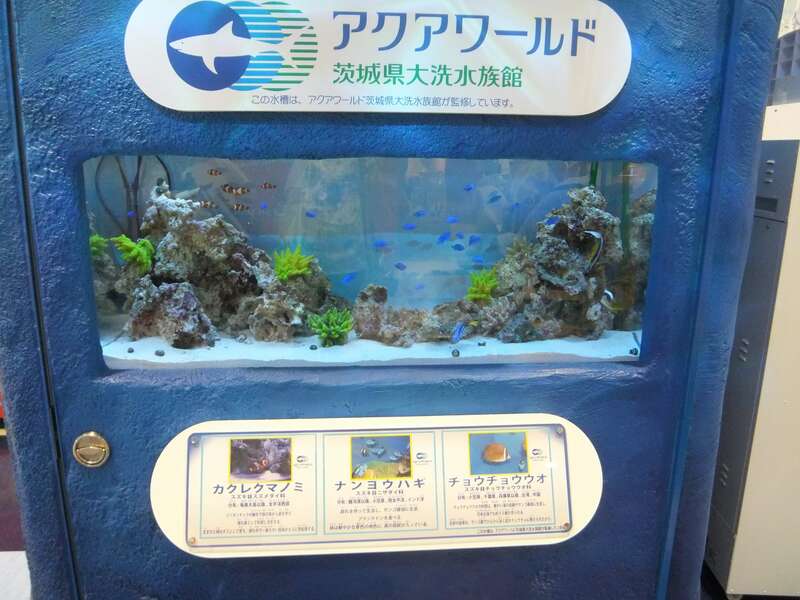 There is also a mini aquarium, think large fish tank, beside that area and a large screen showing the Aqua World aquarium in Mito, Ibaraki that is associated with the amusement area. The other part is a crawling area for babies with a tunnel and mirrors. There are also educational activities on the walls and at a table and a free standing activity too. 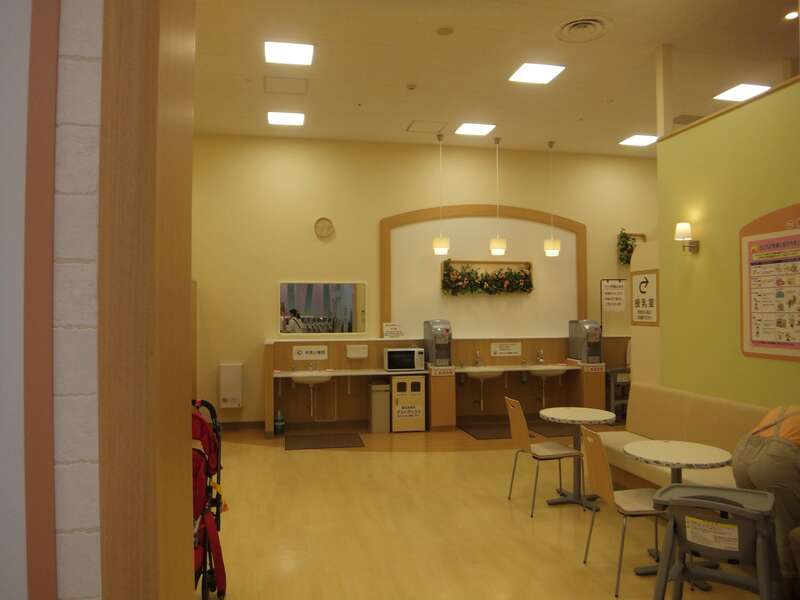 This play area is beside the “baby rest area”, a nursery, changing facilities (both the tape nappy and pull up type), children’s toilet, feeding area complete with high chairs with straps (a rarity in Japan), baby weighing scales and a height chart, a microwave, two burcos (clean boiled water for bottles) and 3 sinks for washing hands. 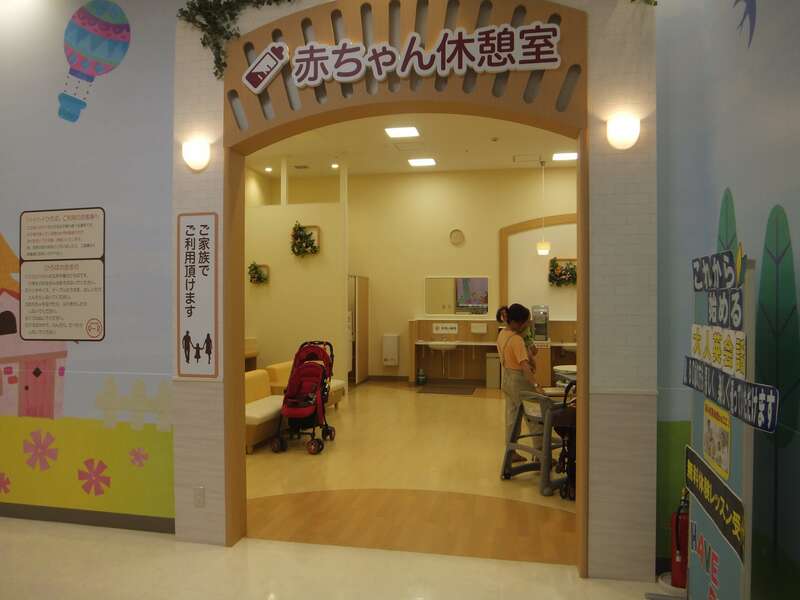 There is also a “baby consultation room” there, but I’ve yet to check that out. There are other facilities dotted here and there, like character trolleys that keep the kids entertained as you shop, small toilets for children and changing stations in the main toilets. There are also some events coming up, like a bus train this weekend (July 20th/21st 2013). The parking is free and most shops have opening sales until this week. The traffic wasn’t bad today, but I don’t know what its like at the weekend. It’s off route 17 and route 323 and near route 51. It’s a ten minute bus ride from Ageo station. It’s great when you find a new hang out. pity its so far from the train station otherwise i’d check it out!